Being a gamer isn't a cheap hobby... that's for sure. Most of you whom read this, knows this. With games sitting at $60 a pop when first released (a NA price, I know worldly it's all over the place) for a standard edition and special/collectors/limited editions going up from there, honestly drugs might be a cheaper way to spend one's cash. As time goes on, I get better at spending money on games and I leave only the most anticipated games for launch day pick-ups and even fewer of those for collector edition considerations. Instead I choose to wait for price drops or the purchase of used games (generally price drops, as I like the idea of supporting the developer even if I do it at a smaller offering instead of giving places like EBGames my money). Steam, GoG and sales across console digital stores sure help out quite a bit as they allow one to acquire lots of games at a fraction of the price you'd pay elsewhere. Erm, that's not really the point of my blog though. The entire point is that... sometimes... as a fan of games and particular titles... we, as gamers, seem to make even more special exceptions for spending money on stuff that... we probably don't 'need' but still like to collect and stare at in awe. Such is the case for my next purchase. Holy crap. I wanted it instantly. I added it to my cart and browsed the rest of the site, adding a hoodie and other other goods to my cart as well. At nearly $300 in total goods, I just sat back, raised an eyebrow and said to myself "I'll sit on this, think it over later" and left the site. I went about my evening and did whatever, came back later and checked in on my list of "goods" and deleted them all from the cart... except the original lithograph that I had spotted. 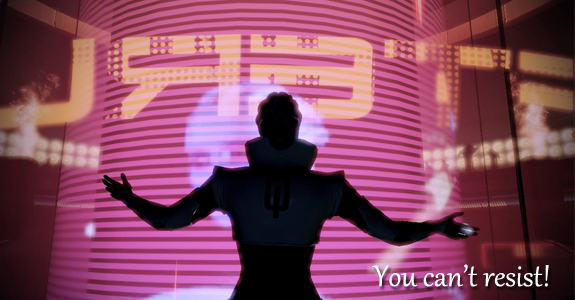 It features the Asari Aria T'Loak, whom if you remember Mass Effect 2, is a criminal overload of epic proportions. She's just right mix of edgy and insane with smart and cunning, which is quite the contrast to the other Asari you spend a lot of time with in the series, Liara. I've always liked her as a character and was very excited to see her return in the series third outing. 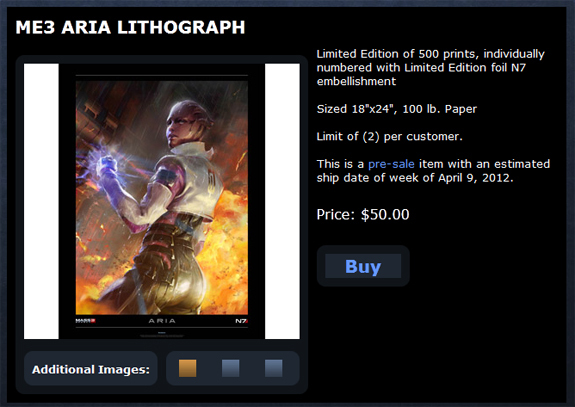 To have Bioware then throw this up on their store in a limited quantity of just 500 prints just made my day.